You can see the precision of the semiprecious stones how beautifully each petal of flower, buds, leafs & stems are manually shaped & cavities are made into the marble. This art piece will be a family heirloom you will enjoy this piece every time you see it. Treasure it before it sold & you miss this golden opportunity. This beautiful vase is something which is an art piece & will be heirloom for your generations. 1. Mother of Pearl --------- White Shiny Stone. 3. Malachite ---------- Green Stone. 4. Carnelian --------- Orange Red Stone. Exclusive green marble semiprecious stones inlaid decorative vase is a fine decorative art piece. It can displayed on side table, middle of the table top & on the mantel piece. 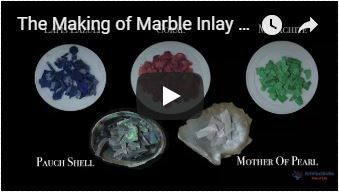 It is difficult to inlaid the semiprecious stones on the marble vase because it has a round surface, as we have to cut the semiprecious stones rounded to maintain the smoothness of the marble. It is the piece of art work. Add the royal touch of Mughal Era to your Home Decor. it is an investment forever. The marble inlay floor vase is made in Agra India & fully handmade. To maintain the marble floor vase simply clean it with soap & water & dry cotton cloth. The marble inlay floor vase will be delivered by FedEx or DHL free of cost door to door. The parcel is dispatch with proper packing & fully insured covering all kind of risk. It is an art piece which will be a beauty & the conversation piece at home.